We looked at functionality, strength, and real user reviews to pick the best gates to keep your wee ones safe. We switched up the format of this page for 2019 and added descriptions for the gates that made our Honorable Mentions list. This baby gate is Amazon’s top seller, and we can see why: Regalo delivers simple installation, a walk-through door, and a one-touch safety lock—all at a price that won’t break the bank. Of all the gates we looked at, it’s the easiest to set up (and take down). This gate features easy pressure mounts, and it comes with hardware and wall cups in case you want to mount it permanently. As noted in its name, this gate features a convenient walk-through door, but the gate is fairly narrow, which makes the door a tight (or impossible) squeeze for a large number of users. The one-touch safety latch is great for parents who’ve got their hands full. Unfortunately, as kiddos get bigger and brighter, many of them are able to figure out the latch, which means this gate may only work for a year or two. Many baby gates tout easy one-hand operation, but few deliver as well as this Munchkin baby gate. Among parents and caregivers, this gate stands out every time for how easy it is to open. We also like the self-closing feature that ensures the gate always stays locked. It features a childproof dual locking system that’s easy for grownups to use but tough for kids to crack. The biggest complaint about this gate is its width. Most users needed to buy the optional extenders to make the gate fit across an average-sized hallway. And, because this baby gate includes a bottom bar that stays in place when you open the walk-through door, it can be a tripping hazard for adults passing through. If you need to keep your little one corralled at Grandma’s or during your neighborhood book club meeting, the Evenflo Soft and Wide Gate is the simple solution you’re looking for. At just 6 pounds, this lightweight baby gate is easy to tote around as you take your little one from place to place. And it’s so simple to set up and remove that you may want to buy a spare to keep in the car. You do have to step over this gate, which can be a tripping hazard for adults and older kids. Also, unlike most of the gates on our list, this baby gate uses mesh and other soft materials instead of metal or wooden bars, so it isn’t right for use with stairs or long-term, day-to-day use. The Regalo Super Wide Gate does more than create a barrier between typical doorways—it can safely transform a great room into a playroom or operate as a stand-alone playpen. This gate comes with eight 24-inch-wide detachable panels, so you can customize it to work around a fireplace, across a wide room opening, on the deck, around the Christmas tree, and more. Best of all, the whole thing folds up flat for easy storage when you don’t need it. Unfortunately, the very thing that makes this gate so customizable also makes it less stable. Only the very end portions of the gate are secured to the wall, which makes the middle panels a little wobbly. It is made of steel, but the joints that hold the individual panels together are made of plastic. Not only does this make the connections somewhat flimsy, but many customers have had the plastic split or break after repeated use. 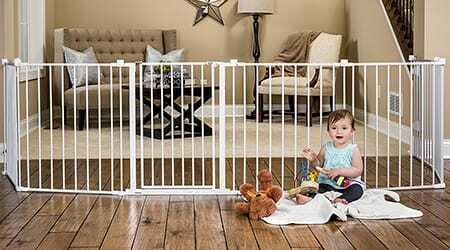 If you’ve got both kiddos and pets, this pet-friendly baby gate is the best. It costs a little more than most of the baby gates on our list, but the price is worth it for the convenience. In addition to the walk-through door that makes it easy for adults to pass through, this gate also features a pet door that’s the perfect size for cats and smaller dogs. It has an easy, one-touch release that makes getting in and out a breeze—even with an armload of groceries or a squirmy two-year-old. Keep in mind that the bars on this gate are wide-set, which means that smaller pets and kittens can make it through even when the pet door is closed. Also, because the pet door is made for animals to access at will, you’ll need to lock it down when you’re using the gate to corral your baby. If you’re a décor-conscious parent and the standard plastic and metal baby gate options don’t fit your style, Summer Infant has some great options for you. Along with most of the standard baby gate features (like a one-hand latch), this gate also has a sleek art deco design that will complement almost any space. These gates can be pricier, but many customers don’t mind paying a little extra to get something that looks nicer in their home. This simple gate for blocking off stairs features a one-hand release and a red or green signal to show whether or not the gate is locked. It can be set to swing in only one direction or in both. Evenflo’s Easy Walk Thru gate is also reported to last for years, but some reviewers say that the mounting hardware is flimsy. This could cause problems with older babies and toddlers who might push hard against the gate. If you need to block off a wider area near stairs, this gate is a great choice. It swings completely open, so there’s no tripping hazard, and it locks shut automatically. Its hardware mounting means you’ll need to drill into your wall, so it may not be the right gate if you’re only using it for a short amount of time. But if you are looking for a durable gate that will keep babies, toddlers, and pets away from stairs, this one will hold up for years. It also comes in a bronze or linen finish, so it blends in well with most decor. If you’re looking for a basic gate that’s quick to install, affordable, and a little more-earth friendly, then this is the gate for you! Safety First, a trusted brand for all things baby, offers this no-frills baby gate for easy and moveable protection. This is a pressure-mounted gate that doesn’t have a walk-through option. If you’re using it near stairs or in a high-traffic area, this could cause problems since you’ll have to step over the gate every time. Some reviewers report that using this gate for pets can be troublesome since the plastic netting can be chewed through. A couple features make this gate from Evenflo a great fit for unusual spaces: the gate is retractable, and its door swings in either direction. This makes it great for small spaces. With metal hardware mounting and a safety rail, this gate can be used for babies or animals for quite a long time. 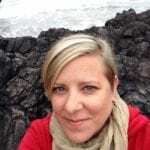 However, many reviewers report that as their little ones aged, they figured out the latch. It’s also a less sturdy gate, so if your baby is likely to push against it, it may not be the right gate for you. These baby gates use a tension system to stay upright. The plus side of pressure-mounted baby gates is that they’re easy to move around. They also don’t put holes in your walls or require much assembly. However, they won’t be able to stand up to strong pressure or someone falling over them. If your child is strong enough, they could push this gate over. Hardware-mounted baby gates are the safest solution. They use caps that you screw into the wall to anchor the gate. With this kind of fortification, the odds of knocking over your baby gate are very low. They’re extremely sturdy and can still be moved around your house if you install caps in different locations. You’re probably familiar with those simple wooden gates that easily block an entryway but require you to step over or take down the gate to pass through. Walk-through gates eliminate those hassles with a built-in doorway that lets you walk through the barrier without having to take down the gate. While your child is rampaging around your home with newfound legs, you won’t want to inhibit your furry children from roaming the house. Some baby gates have small openings for cats to get through. Some have larger gates you can open for dogs. Just make sure the opening is smaller than your child, or the gate will fail to do its job! Once your kiddo starts crawling (or running) around the house, there’s a whole new world of risks to trip them up. Protect your little one with safety gates that keep them out of danger zones near stairs or fireplaces. But before you hit the purchase button, keep these safety considerations in mind. Where do you want to use the baby gate? The future home of the safety gate can make a difference when selecting the best type of gate for your needs. If you want to protect your baby from falling down the stairs, you need a baby gate that’s sturdy and unlikely to slip out of place. Look for hardware-mounted gates or specifically designed stair gates that won’t fall down on the job. 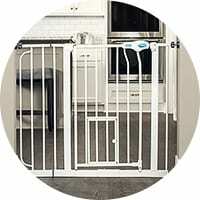 If all you want to do is keep baby out of the kitchen or corral them in a safe play yard, then a pressure-mounted gate is the practical choice. This way you can easily change the location of the gate to suit your immediate safety needs. For creating safe outside play areas, consider a freestanding or expandable gate that lets you set up an instant barrier. Will you need to move the baby gate? If you plan to move the baby gate around the house as you go about your day, you’ll need to pick a child safety gate that’s designed to be on the go. Because kids rarely stay in one place for long, we’ve included a few mobile-friendly, retractable safety gates in our top ten. The portable safety gates we like best are compact, easy to install, and feature a simple release that can be operated with one hand. Another perk that comes with baby gates that are easy to move is the ability to take this safety tool with you to Grandma’s house or the office. 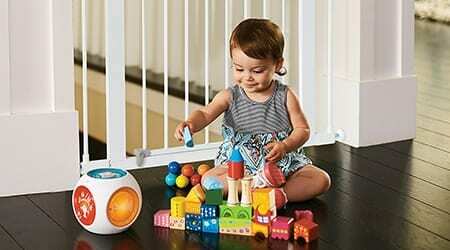 A portable safety gate helps you instantly baby-proof almost any place you want to go. Do you need a safety gate for pets and kids? If your home is blessed with both a child and a fur-baby, then you need to consider the safety of all the little ones scurrying underfoot. Sometimes you may want to keep baby and pet separated, and other times you want to make sure that kitty can still get to the litter box even when the safety gate is up. Fortunately, more safety gate makers are taking these multiple needs into consideration. There are a number of gates out there that are designed to work for both children and four-legged family members. To make your selection easier, we’ve noted which baby gates on our top ten are also pet-friendly. Just be sure to avoid using a pet-only gate to protect your child. 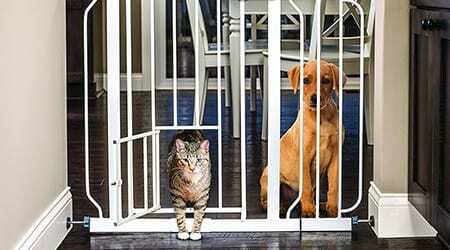 Pet gates don’t always meet the same safety standards that gates for babies and children do. Is the baby gate safety certified? Speaking of safety standards, you want to make sure any gate you rely on to keep your little one safe meets all current safety standards. We recommend looking for a gate certified by the Juvenile Products Manufacturers Association (JPMA), which enforces the safety standards of both the Consumer Product Safety Commission and the American Society for Testing and Materials. Things they look for include the height of the gate; the distance between the bottom of the gate and the floor; the durability and strength of rails, bars, and the frame; and the reliability of the latches. All of the gates on our list (except the Carlson gate) are JPMA certified, but always check the product information or packaging for evidence that any safety gate you purchase meets these standards. When it comes to choosing the right safety gate and installing it correctly, these are the tips you need to know. 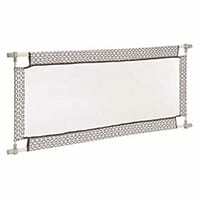 Nearly every baby gate out there is adjustable or expandable. This should make finding the perfect fit easy, but it can actually make things trickier. You need to consider both the width and height of the baby gate as well as the type of door frame or other opening that you’re looking to block. Avoid common pitfalls by measuring your opening before purchase and thoroughly reading the manufacturer’s instructions. 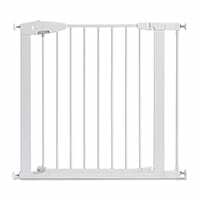 If you’re using a pressure-mounted baby gate, be aware that many appear to be warped or curved, which makes some parents fear the gate is faulty. This is an intentional design feature, though, and it ensures a proper, solid tension fit. 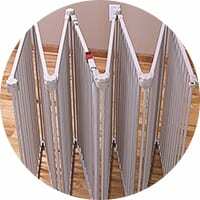 To install retractable baby gates on banisters, hollow walls, or iron railings, purchase a special gate installation kit to ensure a safe, sturdy fit. You don’t want little arms and legs (or heads) getting stuck in between the bars of your safety gate. Make sure the slats on your gate are less than three inches apart. This should prohibit most children from sticking their necks (or other body parts) out. You can avoid this concern altogether by purchasing a gate without slats, like our number three pick above. And don’t forget about your four-legged family members. Pets can also get stuck in an opening between slats, so keep their heads and legs in mind when measuring as well. Beware of unusual spaces in decorative baby gates, like those on our number six pick (see comparison table). Users of this gate report rambunctious puppies and kitties getting their heads stuck in the bottom of the gate where the bars stop. Sometimes there’s no way to know how something’s going to work out until you give it a try. Before you leave your baby to play near a safety gate, give it a thorough once-over to ensure everything is working properly—especially if you’re using it as a fireplace safety gate or Christmas tree gate. After the gate is installed, test how sturdy it is. You want it to remain firmly in place no matter how much pressure your child places on it. Check all locks and latches to make sure they work correctly. If you have older children in the home, teach them how to properly lock and unlock the gate so that no one accidentally leaves it open. If your gate has a self-locking latch, test it to make sure it securely locks each time. Many baby gates include walk-through doorways that can swing both ways. This makes it easy for grownups to seamlessly move from room to room, but it can present a hazard for babies and toddlers—especially if the gate is used by stairs. Gates placed at the top of stairs should only swing away from the stairs, toward you as you approach and open the gate. Child stair gates that swing out over the stairs can lead to an accidental spill if your little one somehow gets the gate open. If you have a baby gate with a walk-through door that swings both ways, make sure you can lock it into the appropriate swinging position before placing it atop the staircase. To be extra safe, only place gates with doors that swing one way at the top of stairs. Never let your child watch you step over the baby safety gate. Little ones love to copy us, and this is an open invitation for them to plot an escape. Avoid putting risky ideas into your baby’s head by using the walk-through gate or opening the gate every time you pass through under their watchful eyes. Nothing’s more important than keeping your child safe, but it can be difficult to know which products to trust. That’s why we dug into the top-selling baby safety gates on the market to find the best ones for your family. We picked our top ten baby and safety gates from more than twenty gates initially considered. To make our list, each gate was evaluated for durability, strength, ease of installation, multi-use functions, and price. We also looked at JPMA safety regulations and certifications as well as expert and parent reviews.